The home stretch for year-end planning. A Santa Cruz live luncheon seminar for tax professionals. Holiday season half-price sale for books. Last chance to adust withholding for 2010. Reminder about electronic payments required during 2011. Guidance issued for auto dealers for uniform capitalization. Using tax preparation software didn't protect taxpayers. California suspends net operating losses--again. Are wills and trusts taxed differently? 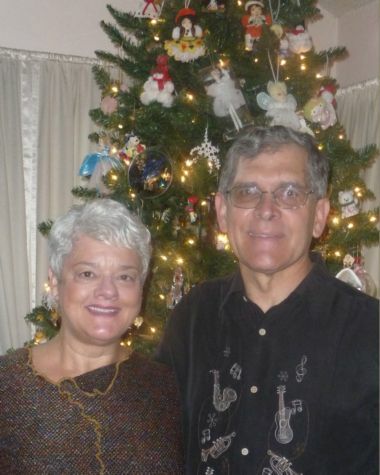 Janet and Michael Gray with their Christmas tree. Yep! We already have it up and decorated! Hanukkah is December 1 â€“ 9 for 2010. Christmas falls on a Saturday this year. I tried to warn you the year is ending fast! Hope you enjoy celebrating the holidays and that your holidays are happy and safe. The home stretch for year-end planning (and when we're closed during December). There is precious little time left for year-end planning. Dawn Siemer is taking the last week of the year off to be with her family, leaving me to fend for myself. The office will be closed on December 23 and 24. If you want to schedule a planning conference, make it now! Call Dawn Siemer on Monday, Wednesday or Friday from 9 a.m. to 5 p.m. (before December 24) to make your appointment. Times available are limited. Michael Gray, CPA will give a live luncheon presentation for the Santa Cruz Discussion Group, Silicon Valley San Jose chapter of the California Society of Certified Public Accountants on Thursday, December 9 from 12:30 to 1:45 p.m. The topic is the IRS Disclosure and Use Rules. The luncheon will be at the Louden Nelson Community Center, 301 Center Street, Santa Cruz. The pre-registered investment is $20 for CalCPA members and $25 for nonmembers. For reservations, call Julie Jameson at 650-802-6221 or register online at www.calcpa.org. Holiday season half-price sale for books by Michael Gray, CPA. Subscribers to our newsletters can buy any of Michael Gray, CPA's books for half price until December 31, 2010. The books are Secrets of Tax Planning For Employee Stock Options, 2009 Edition (regular price $199.97, sale price $99.99), Real Estate Tax Handbook, 2008 Edition (regular price $49.97, sale price $24.99), and Employee Stock Options â€“ Executive Tax Planning, 1998 Edition (Regular price $24.97, sale price $12.49). See the enclosed order form, or call Dawn Siemer at 408-918-3162 on Mondays, Wednesdays and Fridays from 9 a.m. to 5 p.m. to order. You can find details about the books at www.siliconvalleypublishingcompany.com/products/secrets-of-tax-planning-for-employee-stock-options-2014-edition, www.siliconvalleypublishingcompany.com/products/real-estate-tax-handbook-2014-edition, and www.siliconvalleypublishingcompany.com/products/employee-stock-options-executive-tax-planning-2012-edition. Congress's inability to come to grips with the expiration of the Bush tax cuts leaves taxpayers with a dilemma. The promises of solving the procrastination of the last ten years during a one-month lame duck session don't seem realistic. After a congenial meeting of President Obama with Congressional leaders on November 30, the Republicans are playing hardball, and saying they have no interest in compromise. They say no legislation will be passed until the Bush tax cuts are extended for all taxpayers. Meanwhile, we still don't have an adjusted exemption for the alternative minimum tax. If Congress does nothing, taxpayers will have increased withholding for their first paychecks for 2011. The only way to assure getting the current tax rates is to take income this year. Otherwise, gamble on extension of the Bush tax cuts. That means the usual year-end income deferral and deductions acceleration are out the window. Consider taking long-term capital gains in 2010. Note the wash sale rules that apply for losses don't apply for gains. So, you can sell a stock, take the gain, and buy the stock back without losing your tax result. If you have an installment sale during 2010, consider electing out and reporting the income for 2010 instead of as collections are made. If you had an installment sale for a previous year, try to collect as much principal as possible during 2010. Some individuals "harvestedâ€� capital losses for depreciated stock in 2009. Remember those loss carryovers will reduce taxable income from capital gains for investments sold during 2010. Consider accelerating ordinary income to 2010. Cash basis taxpayers can collect retainers or send early billings. When planning for deductions, consider the alternative minimum tax. State tax deductions, property taxes, and miscellaneous itemized deductions aren't allowed for the alternative minimum tax. The American Opportunity Tax Credit, is scheduled to expire after 2010. It may be advantageous to prepay 2011 education expenses by December 31, 2010 so that you can claim the credit on your 2010 federal income tax return. If you want to get a charitable contribution for 2010, consider paying for it with your credit card. The donation is deductible on the credit card transaction date. Consider the ability to convert a regular IRA or 401(k) account to a Roth account for 2010. Instead of deferring the income to 2011 and 2012, consider electing to have all of the income taxed in 2010 (if you can afford it). Does your S corporation still have accumulated C corporation earnings and profits? Get them paid out at bargain rates before the year end. The federal tax rate for qualified corporate dividends is scheduled to increase from 15% to 39.6%. If your corporation has the cash, consider paying a dividend before the year end to take advantage of the current 15% federal tax rate. If your corporation doesn't have cash but you can afford to pay the income taxes, consider making a consent dividend from a C corporation. You can receive additional tax basis (investment) in the corporation at the expense of paying a 15% tax instead of a 39.6% tax. Tax-deferred exchanges aren't as advantageous when the long-term capital gains rate is 15% versus a future 20%. Remember you can't "elect outâ€� of an exchange. The transaction qualifies or it doesn't. Purchases of over-the counter drugs will no longer be deductible for employee flexible-spending arrangements (cafeteria plans) after December 31, 2010. Stock up on aspirin before January 1, 2011! The nonrefundable 30% credit (up to $1,500) for qualified energy efficiency improvements to an existing home during 2009 and 2010 is scheduled to expire after 2010. This may be your last chance to get the tax credit for installing insulated windows or a more efficient furnace or air conditioner. If you have an IRA and you are over 70 Â½, remember to take your required minimum distribution by December 31 (April 30 of next year if you reached age 70 Â½ during 2011). Individuals with inherited retirement accounts or who are taking distributions as a series of substantially equal payments also must take required distributions by December 31. Remember the federal gift tax rate for 2010 is 35% (after the $1 million lifetime exemption) and that the generation-skipping tax is repealed for 2010. Now may be the time for making direct gifts to grandchildren. Also remember there is a $13,000 annual exclusion per donee, per donor for present interest gifts. Businesses can take advantage of the extension of 50% bonus depreciation and higher expense (up to $500,000!) election available for 2010 by making year-end purchases of depreciable assets. Remember, the asset must be in service before the end of the year to qualify for depreciation. Last chance to adjust withholding for 2010. If you have enough control over your payroll, review your 2010 withholding. Unlike estimated tax payments, withholding is consider paid evenly during the year, even when most of it is paid at the year-end. You can avoid penalties for underpayment of estimated tax by "catching upâ€� on underwithholding in December. Almost all employers will have to make federal tax deposits, including payroll tax deposits, using the Electronic Federal Tax Payment System (EFTPS) starting January 1, 2011. If you aren't already set up, do it now because it takes a little time. California has been waiving penalties for high income taxpayers who haven't made their estimated tax payments at the Franchise Tax Board Web Site, www.ftb.ca.gov. Electronic payments are required once a person (a) makes an estimated tax or extension payment over $20,000, or (b) files an original tax return with a tax liability over $80,000. The 1% penalty will no longer be waived effective with the January 15, 2011 installment. Once you do it, you'll wonder what the fuss was about. If you need help, your tax return preparer can get you started (for a fee). Under the Uniform Capitalization rules, certain taxpayers are required to allocate certain operating costs to their inventory, postponing the tax deduction until the inventory is sold. The IRS has issued rulings that are burdensome to Motor Vehicle Dealerships. Now the IRS has softened its position and issued two safe-harbor methods for applying the Uniform Capitalization Rules for motor vehicle dealerships. Dealers can use either or both methods, and the change of accounting method is automatically accepted by the IRS. Under the retail sales facility safe harbor, a motor vehicle dealership can treat its entire sales facility from which it normally and routinely conducts on-site sales to retail customers, as a retail sales facility. The dealer doesn't have to capitalize handling and storage costs incurred at the retail sales facility. Under the reseller without production activities safe harbor, activities that a motor vehicle dealership or a contractor perform on dealership-owned vehicles and customer-owned vehicles are handling activities. However, the cost of these handling activities aren't required to be capitalized to the extent that they are incurred at the dealership's retail sales facility. A motor vehicle dealership using the reseller without production activities safe harbor may also use the simplified resale method for its Uniform Capitalization computations. Motor vehicle dealers should consult with their tax advisors about adopting these new safe harbors, which should simplify their lives while complying with the IRS's Uniform Capitalization rules. Using tax return preparation software didn't protect taxpayers from accuracy penalties. Taxpayers deducted gambling losses of almost half of their reported adjusted gross income. The deduction was in error. The taxpayers had no gambling winnings, so none of the losses were deductible. The taxpayers claimed the 20% accuracy penalty shouldn't apply because the tax return preparation software that they used didn't prevent them from claiming the loss. The Tax Court ruled the penalty applied because relying on the software wasn't a reasonable cause for disregarding the rules and regulations, resulting in a substantial understatement of income tax. California suspends net operating losses â€“ again. As part of the California budget passed on October 8, 2010, net operating losses are suspended again for the 2010 and 2011 taxable years. The suspension will not apply for individuals, estates and trusts with federal modified adjusted gross income of less than $300,000 and corporations with preapportioned income of less than $300,000. My husband and I have wills where we are each other's beneficiary. Beyond this, our children get everything 50:50 in a trust. Will the children have to pay more taxes because the money is in trust than they would if we had a traditional will? No. The income tax returns for the trust and a will are very similar. Hopefully you have consulted with an attorney to get estate planning advice for your individual situation.